Here's the second look with the Happiness Boutique, if you missed the first check it out here! 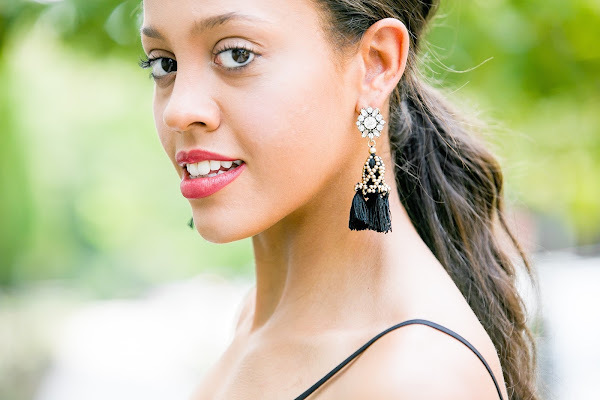 These black tassel earrings instantly caught my eye since tassel earrings are trending right now but these ones in particular have a vintage, romantic vibe that I love. What else is romantic, lace, this lace LBD was a no brainer, throw in a leopard clutch and I had three of my favorites in one look. The Happiness Boutique is seriously your one stop shop for vintage inspired, on trend pieces, plus they offer free shipping AND a customer reward program. Yep, that's right they reward you for shopping with them, don't believe me? All the details are here and they are pretty sweet! So which look was your favorite, pretty in pink or vintage black? Linking up with Summer Style, WIWT, Throwback Thursday, and Thursday Favorites! What a lovely dress! It's so simple yet so chic! I love how you kept the outfit so simple and paired it with those stunning earrings!! Looking HOT!! !